I was given this prestigious award by a good friend. Her name is Jessica Martin aka @red_writinghood at www.redhotwritinghood.com. She is smart, witty, and a great friend to have. The fact that Jessica finds my blog inspiring is an honor, because she speaks from the heart at her blog, whether it is about life, weight loss, or her family. If you have not had a chance to check out her blog, stop by and take a look! You will be glad you did. Display the award image on your blog. 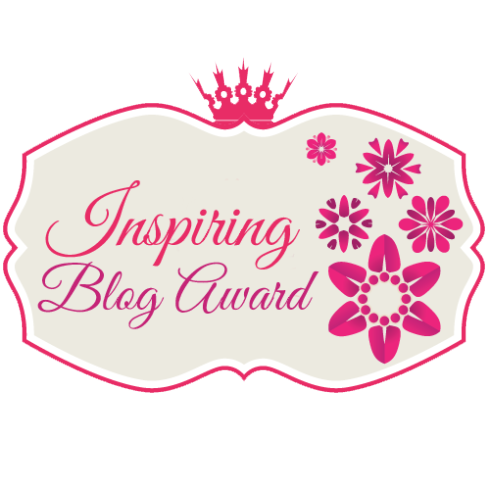 Nominate 15 other bloggers and link to their sites. Notify the bloggers that they have been nominated and link to the post. 7 Things About Me………Do you really want to know? I am a very independent woman, with a stubborn streak. I can take care of myself. I holler at talk to traffic when I am in the car. My son says the other drivers can’t hear me, but I do it anyway. I am a cat lover, and a Cancer on the astrological charts. I hate to shop! I know, that is strange for a woman to say. I would rather be cleaning, or cooking, which I hate, than shopping. I have a thing for earrings, some people own tons of shoes, I own too many pair of earrings! I read 54 books in 2012. I am an avid reader, as reading is my favorite hobby. Mexico is my home away from home. I love to travel, and I have often, but my heart always returns to Mexico. Now, as you can imagine, this list could have gone on and on. There are so many talented bloggers, it was hard choosing just 15! Please stop and visit these blogs, as I am sure you will find yourself enjoying them as much as I do. Thank you to Jessica once again for this wonderful award. I hope I continue to be as much of an inspiration to you as you are to me. This entry was posted in General and tagged award, blog, friend, inspiration. Thank you so much for including me. I think it is one of the greatest honors for someone to say you are an inspiration. 🙂 And congrats on receiving the award! Congratulations on your award! Found you through Bloggy Moms.